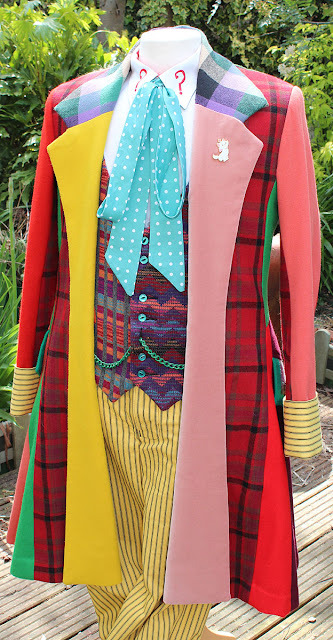 I’ve enjoyed showing off my Ultimate Six Frock Coat recently, but the costume is nothing without the extra items that make the ensemble complete. 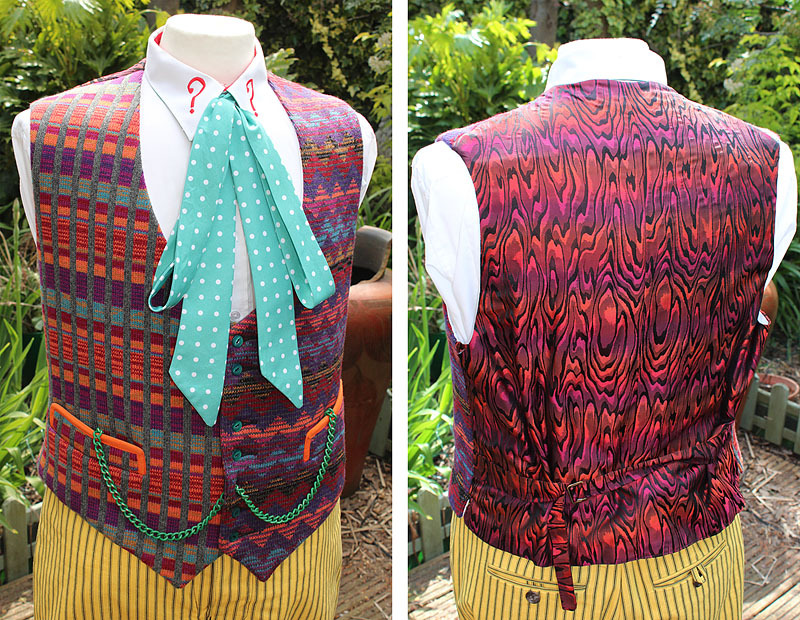 One of the things I needed to sort out for myself was a waistcoat. 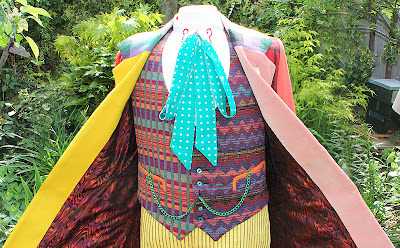 Of the three different versions worn by Colin Baker, my personal favourite has always been the original from season 22. I liked the fact it had more muted colours, which somehow made the coat standout all the more. The later silk waistcoats just fought the coat and neither won. Now I know the costume is supposed to tasteless, but there are limits! 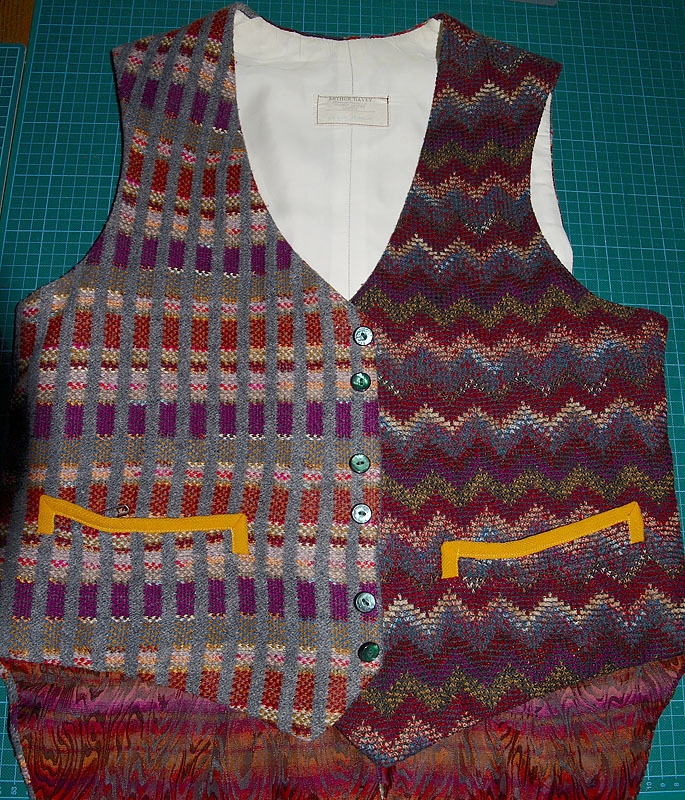 For many years I thought the waistcoat was made from a tapestry fabric or something similar, but when I got to see the original first hand I was amazed to find it is made from knitted fabric, cut as cloth. Each side has a very distinctive design: on the left is a geometric grid, with vertical lines of grey and blocks of colour in between; the right has a zig-zag design, with a curious lattice stitch across the surface. 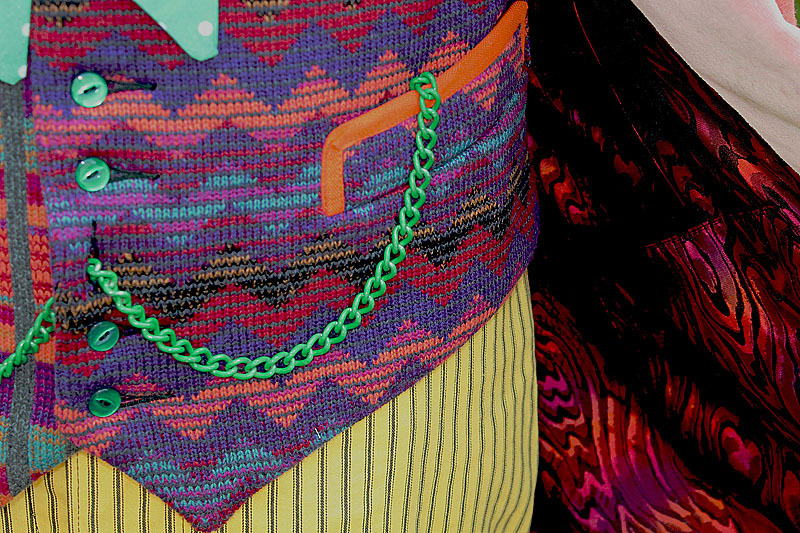 I knew from the outset it would be a very difficult garment to match, but I was determined to achieve it. I could see every stage would be a challenge, from making the fabric to assembling it into a waistcoat. My college tutor and a fellow classmate who is an avid knitter were both at a loss as to how to replicate it. I quickly learned there were potential limits to what can be achieved even with modern domestic knitting machines. I needed to find a amateur machine knitter with the skills and vision to devise a way to achieve domestically what had been created industrially. Internet searches turned up the Machine Knitters Guild, through whom I contacted over 100 UK-based knitters. All said it was not possible or outside of their ability. No-one seemed to know where to start - that is all but one knitter who was mad enough to take it on! 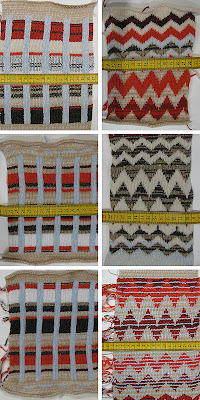 She understood what I was looking for and with some inspired lateral thinking devised a way to recreate it within the limitations of the domestic knitting machines, which essentially can only handle two yarns in any one row of knit - this pattern required up to 16!!! First we had to sort out the basic pattern and get the scale correct. 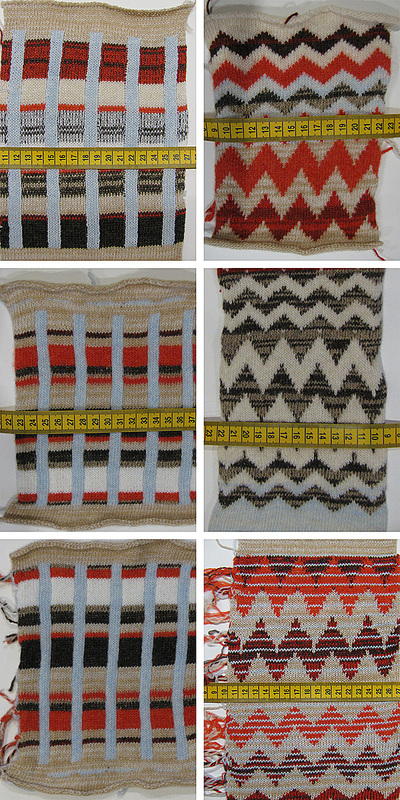 We went through a number of small simple knits which were solely for stitch count, so ignore the colours being used. After a bit of adjustment we had a combination we were happy with. 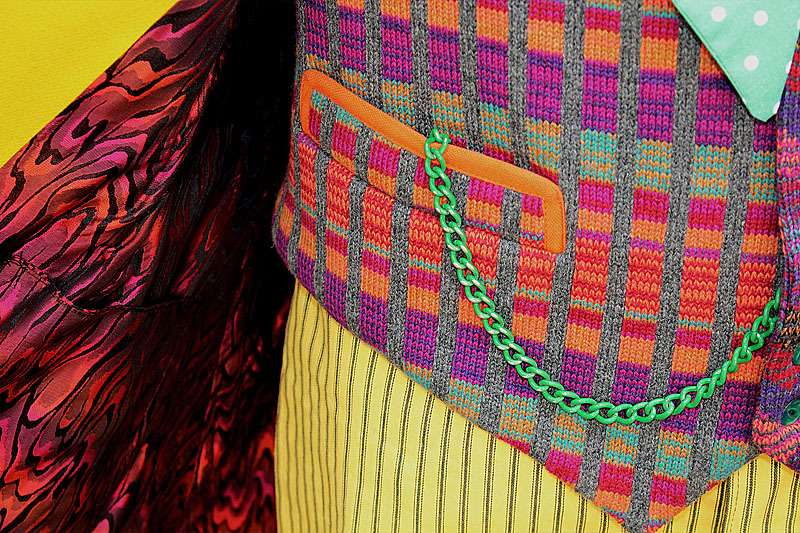 The original knitted fabric uses an eye-watering number of yarn colours, some of which are hardly used. At this stage using all is well out of my budget, so we narrowed it down to eight essential colours which would give enough of a range to produce a visual match. 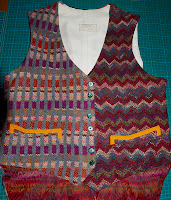 Once the pattern was established, and the yarn colours chosen, all that remained was the arduous task of knitting the fabric needed to make the waistcoat. Although we are using a machine to knit the fabric, it is not a simple case of bashing out yards of knitting. No two colours are used on more than three or four consecutive rows before they have to be switched for a different pair. This has to be changed manually, so progress is slow and laborious with continual stop-start to keep up with the pattern. Nonetheless, my knitter was a real trooper and was able to knit me a good couple of metres of fabric in the time we allowed for the job. All I had to do was make the fabric up into a waistcoat - and that's a whole other story! Your work makes me fall in love the Doctor Who costume pieces that I've never usually given a second thought. Gorgeous work as always Ricks. Really is quite impressive how much work has gone into six's costume, considering how much hate it gets for being bashed together and ugly. It really is quite a feat of worksmanship. Also, not to be pedantic, but didn't the real waistcoat have a tailback? The original has tails, but a second one was made without. This is really just my prototype and I have limited knit fabric so just did the fronts. Technically the back should be knit too, not linking fabric, but I was wearing this at Gallifrey One and wanted to keep the heat down in the costume. I'm getting more knit made and now back in the UK will look to do a FULL replica with all the bells and whistles. How durable is that fabric? And I have to say it was less scary to work with than I'd feared. Just needed to let it know who was boss!